President Donald Trump's top allies in the media have struggled this week to formulate a coherent defense of his administration's immigration crackdown, oscillating between talking points to provide the president cover for the widely-condemned zero-tolerance policy that has resulted in children being separated from their parents at the southern border. Members of the pro-Trump media seemed to share the same goal: Fending off an onslaught of criticism directed at the White House by members of both political parties. But the ways in which each defender has gone about doing this differed, ranging from falling back on tropes and arguments often employed by white nationalists, to portraying immigrants as threats, to outright dismissing the controversy as part of a fictitious plot. The shifting defenses of the unchanging policy seems to reflect the White House's inability to crystalize an effective explanation to blunt the mounting outrage. Trump, for instance, has suggested he is no fan of the policy and called on Congress to "CHANGE THE LAWS," while simultaneously characterizing immigrants as crime-committing individuals who want to "infest our country." "The confusion of the Trump media mirrors the confusion in the Trump White House and I think really reveals how dependent they are on having a coherent spin out of the Trump White House," Charlie Sykes, a conservative talk show host and author of "How the Right Lost Its Mind," told CNN. "It exposes the backstage confusion. There is no coherent party line. It shows their dependence on him setting the theme." As the story bubbled to the surface over the weekend, several different talking points emerged. One came early on by the way of Ann Coulter, an anti-immigration hardliner. Appearing Sunday on Fox News, Coulter claimed the children at detention facilities were "child actors" and implored the president not to "fall for the actor children." 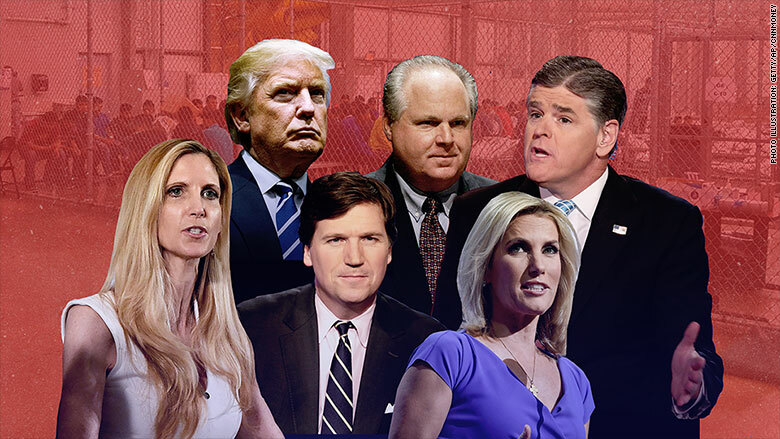 The next day, Rush Limbaugh, the top-rated conservative talk show host, effectively fed his audience a strain of Coulter's theory by suggesting that what is happening at the border is not a real news story. He referred to the scenes playing out on the border as an "entirely manufactured crisis," saying Democrats "have to change the subject" away from news good for Trump, like positive economic numbers. 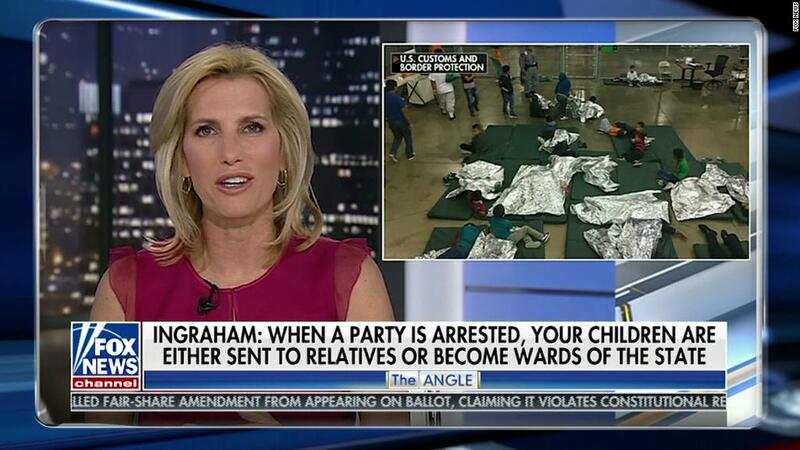 And Laura Ingraham, the Fox News prime time host and radio personality, dismissed the crisis as "phony border outrage" on Monday. She said the children who have been ripped from their parents and taken to detention facilities, where some have been held in metal cages built of chain-link fences, are "temporarily housed in what are essentially summer camps." Other organs of the pro-Trump media body took a different approach, seeking to depict young immigrants as threats. On Monday morning, Fox News' website led with an "exclusive" story about the "danger" it said the Deferred Action for Childhood Arrivals policy posed. The program permits some individuals, who were brought into the US illegally by their parents, to remain in the country. The Drudge Report, the highly-trafficked conservative news website that often sets the narrative for the rest of the conservative media, also attempted to paint a picture of the immigrants being detained by the administration, including the children, as potentially dangerous. The website on Monday morning paired a photograph of Syrian children holding toy guns with a headline about the children being detained at the border. The photo was later taken down, but the implication was clear: That minors being held in detention facilities posed a potential threat. The photographer who captured the image, Christiaan Triebert, told CNN the Drudge Report's use of the image was an "obscene misrepresentation" of his work. Tucker Carlson, the Fox News prime time host, went another route, using rhetoric similar to what one would anticipate from white nationalists. He said that the humanitarian organizations, members of the media, and politicians on both sides of the aisle who have spoken out don't actually care "about helping children." "Their goal is to change your country forever," Carlson said. "And they are succeeding, by the way." The pro-Trump media also floated alternative defenses. At one point on Monday night, the Fox News website harkened back to the Obama years, attacking the former president for his immigration policies. At other times, media allies like Sean Hannity, the Fox News host and close confidant of Trump, have said the responsibility lies with Congress to take action, echoing the president. Like the White House, it has seemed at times that the only clear message coming from Trump's media defenders is perhaps that there is no clear message at all. "I think one of the things Trump has discovered," Sykes said, "is that ... you don't necessarily have to be coherent or truthful for people to support you."